When it comes to Search Engine Optimization, one of the most important factors that will determine how high you rank on the first pages of Google is domain authority. But what exactly is it and what does it say about your website? Domain authority is a competitive metric that was first introduced by the analytics company Moz to determine the probability of your website ranking higher on Google. In other words, if you are trying to position yourself with specific keywords, and your competition has chosen the same ones, the one that has higher domain authority has better possibilities to score a better position. The tool returns a variety of metrics, so let’s take a deeper look in what each one of them means. Domain Authority: this is the search engine ranking score used to predict your possibilities for ranking higher on Google. Obviously, the bigger the number is, the better. In this case, Coca-Cola has an authority of 68/100, which is a pretty good score, although it has a lot of room for improvement. However, it is important to know that the higher your score is, the more difficult it gets to increase it – it increases faster from 20/100 to 30/100 than from 60/100 to 70/100. Page Authority: this score is determined by Moz in the same was as a domain authority, but it shows the ranking of a specific page within the website. 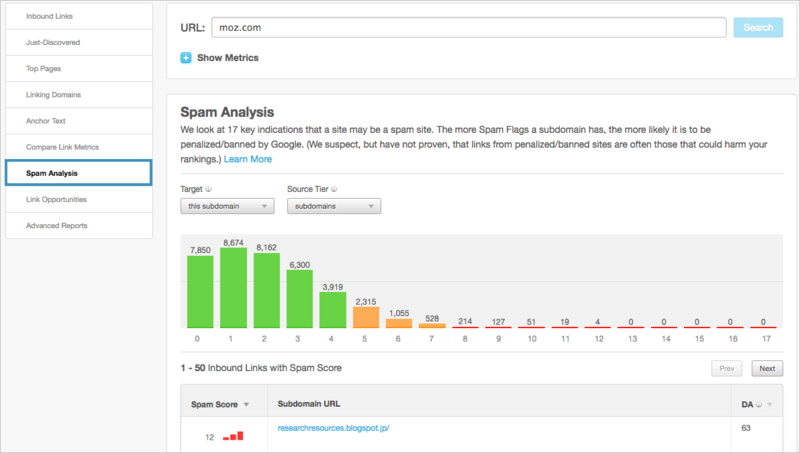 SPAM Score: this metric determines the probability of your website being penalized or banned from Google. Site Link Diversity – if all the external links that are pointing to your website come from the same page or domain, it looks suspicious and is usually a sign for fraudulent activities. Some people buy out external links in order to trick the search engine that their site is authoritative, but it is a practice that’s penalized by Google. Large website with few links – if your website is big, but very few links are pointing to it, it arises Google’s suspicions for spam. Domain Name Length – if the length of your domain name has way too many characters than average, it is marked with a spam flag by Moz. Thin Content – your domain or subdomain has pages with little to no content. You can check all 17 spam factors here. 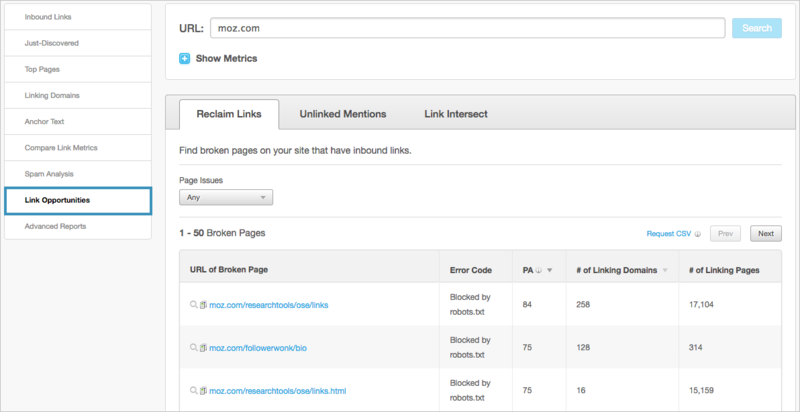 Just-discovered – this metric shows you the recently identified links and URLs that are mentioning your brand. They are really helpful for keeping track of the conversations involving your company, and you can use them to identify spam as well. You can go to the left column to see all the just-discovered links found in the last 60 days, and you can filter them by target, link source, and link type. Root domains – this is the number of unique domains (the highest hierarchical level of a site, such as google.com, or zara.com), that contain at least one link pointing to your website. In this case, Coca Cola has 1,196 root domains, meaning that 1,196 unique websites are mentioning the brand at least once. You can read more on root domains here. Total links – all the links pointing to your website. From this example, we can see that 108 000 external, internal, followed and nofollowed links (not necessarily unique) are taking the user to the website of Coca Cola. Top pages – this report shows the top performing content of your website. You can see which subpages have the highest Page Authority, and use this information to analyze why they are performing better than others. You can only see the first 5 results if you are not a subscriber, but the paid plans unlock up to 10,000 links and unlimited reports. Linking Domains – in this section, you can find additional information and helpful data on the domains that point to your website, ordered by Domain Authority. Anchor Text – if you are unfamiliar with the term, an anchor text is the clickable text in a hyperlink – for example, the anchor text in mymoid.com will be “mymoid.com”. In the context of authority, it can help you see the keywords that websites are using to refer to you. This section is ordered by the linking root domains that contain the anchor text. This report is a great way to see how your page and domain authority compares with that of your competition, and analyze your strengths and weaknesses. In this case, we can see that Red Bull performs better when it comes to Page Authority, MozRank and total internal links, while Coca-Cola has a stronger position when it comes to external links and linking root domains. Naturally, both companies present a room for improvement when it comes to ranking, but each one of them displays different weaknesses that should be taken into account. In this report, you can also find page-specific metrics, subdomain metrics, and root domain metrics. Spam Analysis – a tool that helps you identify bad quality links by determining their spam score. Link Opportunities – with this feature, Moz makes it easier for you to discover new opportunities and get more high-quality links pointing to your website. Advanced Reports – as we already mentioned, Open Site Explorer provides you with meaningful insights even if you are not a subscriber; however, upgrading to a paid version is a must if you want to explore the full potential of the metrics. With Moz Pro, you can create and download advanced reports containing more than 100,000 links. Working towards a higher Domain Authority should be a priority goal for every company that wants to improve its ranking. If you haven´t checked out yours yet, just click here, type in your URL, and start analyzing! Important: as of April 2018, Moz will be no longer updating the index of its Open Site Explorer tool as they are switching to a new tool: Link Explorer. You can still use Open Site Explorer, but I will make sure to update this post to the new version as soon as possible. Previous Post The power of exclusivity: would you spend $300,000 on this purse?